As many commentators have pointed out, although world events may only have been in the background of her novels, Austen’s family were closely affected by the wars and politics of her day; Jane knew plenty about both through the careers of her naval brothers, and also through the experiences of her extraordinary cousin, another Eliza, born in Calcutta and married in Paris to the Comte de Feuillide who was executed at the Guillotine. This Eliza, a notorious flirt until she married Jane’s brother Henry, may have inspired Austen’s worldly Mary Crawford; the adventures of this namesake cousin certainly influenced Joan Aiken in her sequel to Sense and Sensibility – Eliza’s Daughter. But the heroine of Aiken’s novel is the young Eliza, first seen as a bright small girl, the eager acquaintance of two gentlemen called Sam (Coleridge) and Bill (Wordsworth) who enjoy her company and do a good deal to foster her intelligence, and who later, after a brief education in Bath, becomes a talented opera singer, and finally an adventuress in Portugal during the Napoleonic wars, where she travels with a knife down her boot to fend off villains – and where she finally discovers the truth about her feckless father. Aiken’s ‘Austen Entertainments’ as she called them, were thoroughly researched; not only was she deeply familiar with the original novels, but she had fully studied the period, its language, customs and history, and offers some fascinating background detail of her own. One wonderful discovery ( a reminder that this is a country at war!) was about the bedding offered to the girls in the Queen’s Square seminary that Eliza attends. which has another indomitable ( and Spanish) heroine! Eliza’s Daughter is coming to Kindle from Penguin Random House UK. Joan Aiken for Grown Ups…! “It was dusk, winter dusk – snow lay white and shining over the pleated hills…” Sound familiar? 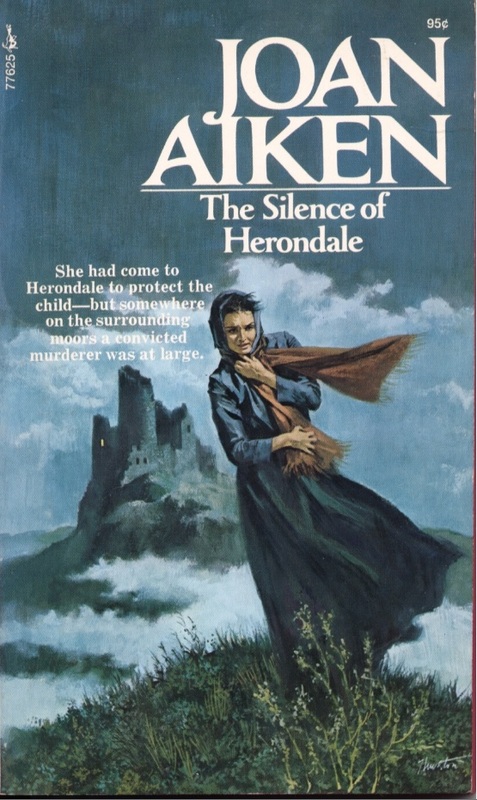 The opening lines of The Wolves of Willoughby Chase could almost describe a scene from Joan Aiken’s first adult novel, The Silence of Herondale published just two years after her most famous children’s classic. The novel draws on her Gothic imagination and ability to conjure scenes of suspense with thrilling chases across wild snowy landscapes, but this time the story is for grown ups, so will there be a happy ending? In the pre-feminist 1960’s women were still struggling for independence but in Joan Aiken’s novels, her courageous and free thinking heroines were based more on models from her own reading of Jane Austen or the Brontes, or indeed on her own experience of being left a young widow with two children and an urgent need to earn a living for herself and her family. In Northanger Abbey Jane Austen wrote a parody of the Gothic Novels of her day, such as Mrs. Radcliffe’s bestseller, The Mysteries of Udolpho where the innocent and virginal heroines found themselves in haunted castles threatened by unknown horrors. Jane Austen’s early skit, Love and Freindship, written in 1790 at age fourteen, poked fun at the Gothic school whose heroines, like Emily in Udolpho, faint at every emergency, both major and minor. Sophia, one of the heroines of Love & Freindship, when dying, advises her friend Laura: “Run mad as often as you chuse; but do not faint.” Over-indulgence in fainting brought on pneumonia, which finished her off! Read more about her Adult novels here. A sister played a more important role than a romantic hero in Jane Austen’s own life; Cassandra was her lifelong confidante, and literary consultant, and after Jane’s death took charge of her reputation and legacy even to the extent of burning many of her sister’s letters. Perhaps because of this special relationship, sisters are of supreme importance in the lives of Austen’s heroines. All six of her completed novels deal with what Sir Thomas Bertram of Mansfield Park considered a young girl’s ‘most interesting time of life’ – the short period when she has the possibility, or in many cases the necessity, of finding a husband – interesting hopes and dreams which may or may not be shared with a bosom companion. When Cassandra’s intended husband died tragically, she gave up any further romantic expectation and turned to the younger Jane for this companionship. In Jane Austen’s Mansfield Park the absence of their father allows the Bertram sisters to fulfil all the fears he entertained about their possible misconduct, as they fall into rivalry, flirtation and finally disgrace. 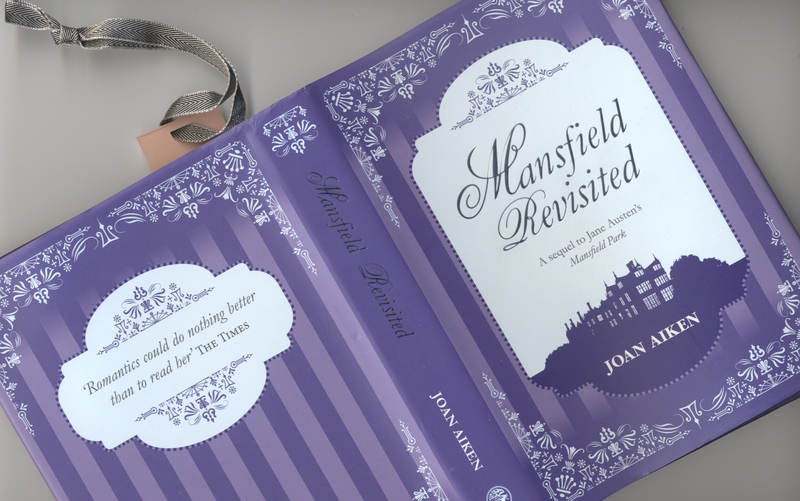 In Joan Aiken’s sequel, it is the more loving Price sisters, Fanny and Susan, daughters of a less fortunate sister of Lady Bertram who are the heroines, and Susan, the younger, is left more or less in charge of matters at Mansfield Park when the older Fanny, now married to Edmund has gone abroad with him to look after the family’s affairs. Bereft, and left at the mercy of mean spirited Julia Bertram, playing the role of her wicked ‘step-sister’, Susan is adopted as companion by the mysterious Mary Crawford, the dangerous heartbreaker of the original Austen novel, whose intervention and encouragement allow romance to blossom for Susan in this imagined sequel. Joan Aiken’s passion for, and knowledge of the life and works of Jane Austen was shared by her own sister, Jane Aiken Hodge, a historical novelist, who also wrote a biography of Jane Austen. The two Aiken sisters shared the early drafts of their novels with each other throughout their writing lives, and benefited from coming from a family of readers and writers who enjoyed communicating their literary passions just as the Austen family members had done. Joan went on to write six novels in this series which she described as ‘Austen Entertainments’, and for those who know their Austen they are extremely entertaining – readers will enjoy not just the coming of age, and ‘interesting time of life’ and romances of the younger sisters introduced in the original novels, but a wealth of tongue in cheek references to characters in the earlier works, and to incidents from Jane’s own life which demonstrate Joan Aiken’s love for and delight in the world of Jane Austen. Perhaps one of the most poignant references is Joan Aiken’s description of the “arrangement of three chairs” on which the ailing Mary Crawford is found resting in her garden. In a letter, a niece of Jane Austen’s described how when Mrs Austen ( a possible model for the constantly suffering Lady Bertram?) is in possession of the sofa, the seriously unwell but self denying daughter Jane “laid upon 3 chairs which she arranged for herself.” With this parallel in mind it is interesting to speculate about other similarities Joan Aiken draws between Jane Austen and her heroine Mary Crawford, perhaps seeing her as an imagined alter-ego who she endows with all sorts of cheerfully witty and ‘wicked’ qualities that she may have shared herself, but which after her death, Jane’s more concerned sister Cassandra sought to suppress and conceal. Jane Austen may well have had adventures of her own, at her own ‘interesting time of life’, but deprived of many letters about her own life, the closest we can come to an understanding of how important these other relationships may have been to Jane, is through the intimate conversations of the sisters in her novels. a companion volume to Lady Catherine’s Necklace – a continuation of Pride and Prejudice which was re-issued last year. Joan Aiken’s Felix & Jane Austen’s Susan – Unlikely Travelling Companions? Aiken’s Felix Brooke and Austen’s ‘Susan’ – or should that be Catherine Morland..? Joan Aiken’s passion for history often led her to wonder ‘what if’ things had turned out differently. What if, for instance, Jane Austen’s early novel, originally entitled ‘Susan’ when she sold it to a publisher in 1803, and which then languished unpublished until she furiously bought it back for £10 thirteen years later, had in fact appeared, even maybe without the knowledge of its author, and had been in the pocket of a young nobleman who ran away to join the Peninsular wars in Spain at the beginning of the 19th century. The young man falls in love, and marries an aristocratic Spanish girl who dies having his baby, and he watches over the boy, disguised as a groom until his own death. He leaves a letter, and his treasured book, to the boy, Felix Brooke, with a message telling him to seek out his long lost family in the city of Bath, England where the action of Austen’s novel had taken place. For Joan Aiken imagined that this was actually Jane Austen’s early novel, ‘Northanger Abbey’ written in the full enthusiasm and confidence of youth, and a delightful parody of all the Gothic romances so popular at the time. The novel is also a description of an innocent abroad, a heroine with a head full of fantasy from reading too many novels, who finds herself alone in a dangerous world struggling to make sense of the behaviour of unscrupulous villains or apparently solicitous friends with nothing but the world of fiction to guide her. This is much the same situation in which the Spanish orphan, young Felix Brooke finds himself, but in a truly wild and Gothic landscape with terrifying brigands and murderers, mountain tribesmen looking for a human sacrifice, or even pirates who specialise in the kidnap of children, with only the assistance of Austen’s novel to sustain and comfort him. 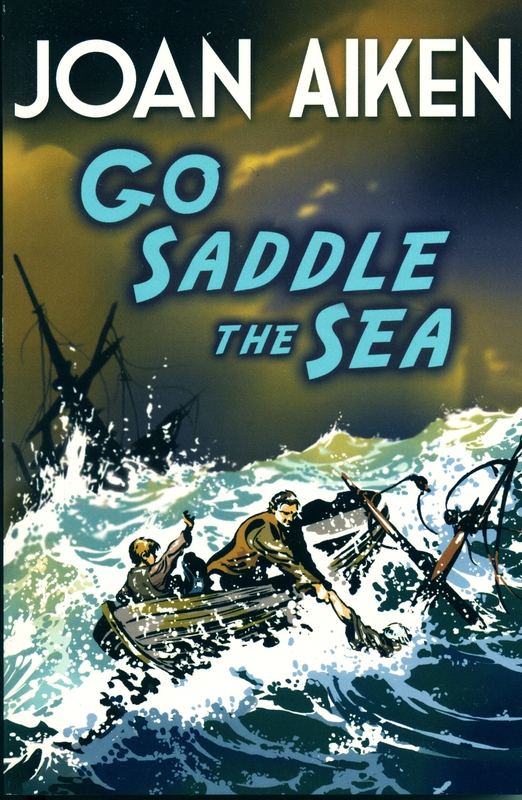 From this we can see that these writers had an equally powerful influence on Joan Aiken’s own work, and by setting her novel, Go Saddle the Sea in just such a rip roaring Gothic world of her own imagination in 19th century Spain, and with a nod at Austen’s own parody, she could have the best of all worlds! Joan Aiken asks: Who should write for children, and what should they write? Hope, Joan Aiken’s greatest gift to us? Giving a voice to women – Joan Aiken’s folk tales for the next generation.